For the last several weeks we've been sticking with the classics. Cars like the Facel Vega HK500, Mercedes-Benz 300 SL and the all-conquering Bugatti Royale — vehicles that aren't so much pure fantasy as they are automotive high water marks. This week we're turning our attention to a modern classic, and the more things change... Back when Farago first launched our little Fantasy Garage, there was no question than an F1 would (someday) grace our car hole. The McLaren F1 should actually be synonymous inside every pistonhead's head with the word "Fantasy." In point of fact, it very well might be the greatest supercar ever made. Which may be why the Sultan of Brunei owns eight of 'em. Have a look. Like most important ideas, the McLaren F1 was conceived on the back of a napkin. 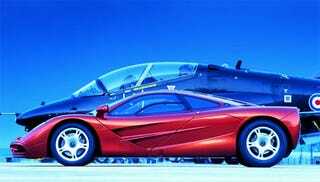 While waiting for a plane, designer and chief engineer Gordon Murray proposed the idea of building the very best, ultimate, super duper driver's car ever to McLaren's CEO Ron Dennis. Ron bit. The idea wasn't new or earth shaking: stick lots of power into a light vehicle to give (horribly wealthy) enthusiasts the ride of a lifetime. Carroll Shelby had been doing exactly that for years. However, what did make the turf move was the execution that is best described as flawless. No, better than flawless. The F1 is supercar 2.0. What's so special? Well, actually, everything - but we'll break it down for you, starting with the amazing engine. From the start, Murray specified that the engine had to be normally aspirated. Forced induction, while creating gobs and gobs of power, does have a few downsides. One issue is that as complexity increases reliability correspondingly decreases. Certainly not a deal breaker but if your goal is to create the greatest driver's car in history, time spent in the shop is bad. But the other problem with super and turbochargers is that when they are spinning, the driver has less control over the engine as an additional layer of buffering is inserted between the mill and the driver's right foot. Not cool, said Gordon Murray. Murray shopped around for an engine, initially trying with Honda and then Isuzu. Honda was a real possibility, as their engines had been powering McLaren's Formula 1 cars for some time. Honda eventually backed away and McLaren decided that as nifty as Isuzu's 3.5-liter V12 would be, they needed to go with a manufacturer that had racing cred. Enter BMW and their M Division. Who better to build you an engine? Murray specified an output of 550 hp and a weight of 250 kilogram (550 pounds). The boffins of Bimmer handed him back a 585 pound, 6.1-liter all-aluminum V12 mill with DOHC and variable timing for all 48 valves that cranked 627 horses and 480 ft-lb. of torque. Murray took it. Obviously, a customized M70 is a pretty spectacular motor. But, if your aim is to produce the very best driver's car in the world then it is going to take much more than big power. The McLaren F1 was the very first production car to feature a carbon fiber monocoque chassis that was derived from McLaren's successful race cars. In case you are wondering, the word monocoque is French for "single shell." What that means in car terms is that the vehicle's body actually supports some of the stress load, rather than building a truss and then covering it with non-load bearing skin. That's right; it's a fancy French way of saying "unibody." But building it from then hyper exotic carbon fiber was a major breakthrough, as this gave the F1 an unparalleled power-to-weight ratio. How unparalleled? The F1 debuted in 1994 with a power-to-weight ration of 501 hp/ton. When the Ferrari Enzo debuted in 2002, it achieved "only" 434 hp/ton. It took the maniac Bugatti Veyron with its 530 hp/ton to best the F1 (just for fun, the SSC Ultimate Aero TT boasts a ludicrous power-to-weight ratio of 1003 hp/ton). If you haven't figured it out by now, the McLaren F1 is fast. Actually, calling the F1 "fast" is like calling Mariusz Pudzianowski "strong." So, let's revise that to read the McLaren F1 is insane. 0-60 happens in 3.2 seconds. 0-100 in 6.3. The quarter mile is dispatched with in 11.1 seconds at 138 mph. 0-150 takes just 12.8 seconds, and 0-200 mph happens in 28 seconds flat. But of course, the F1 isn't done yet, not hardly. On a long enough straight the McLaren F1 hits 240 mph. In 1994! And that's just the "regular" version. Disregarding the 7 prototypes, McLaren built just 100 F1s. 72 "normal" cars and 28 modified racers. 5 LM or "LeMans" cars were constructed. The F1 LMs were over 100 pounds lighter (the standard F1 weighed in at a Lotus-like 2513 pounds). The LMs also had their engines tweaked to the tune of 680 hp. A new transaxle meant that the top speed was down to just 231 mph, but it could hit 100 mph in just 5.9 seconds, a world record. The F1 LM could also go 0-100-0 mph in 8.5 seconds, also a world record. All the LMs were painted Papaya orange except for the two sold to the Sultan of Brunei which are painted black and spaz. As McLaren was indeed a race car maker, 28 F1 GTR races cars were built, one of which won the 1995 24 Hours of LeMans. A whopping 2 homologation F1 GT cars were built. They were essentially wingless, road going versions of the long-tailed, third generation GTRs. Interestingly, most of the GTRs once retired were converted to street use by adding mufflers and removing air-restrictors. And we could ramble on all day long. The F1 was one of the first production cars to make use of downforce as a performance aid. The engine produces so much heat that gold foil from the Space Shuttle is used to shield the engine compartment. It generates over 1.3 Gs of lateral acceleration. The driver sits in the middle while his wife and mistress are seated behind him on either side. Nearly a decade and a half after it debuted, the F1 is the fourth fastest car in the world. It's got flippin' matched luggage that fits smartly into hidden side compartments. But all you really need to know before voting yes or no is that the McLaren F1 held the undisputed title of fastest production car in the world for twelve years. That's longer than any other car ever has. Oh snap! One more thing, the F1 had a real gearbox complete with a clutch. No stinkin' flappy paddles. Happy voting.